This post describes a proposal for making classes and inheritance simpler in ECMAScript.next: “Prototypes as classes”. 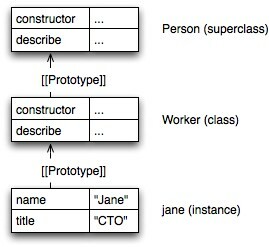 An object can optionally have a prototype, by pointing to another object via the internal property [[Prototype]]. The value of that property can be retrieved via Object.getPrototypeOf(). The prototype object can again have a prototype. The sequence of objects that are each other’s prototype is called the prototype chain. 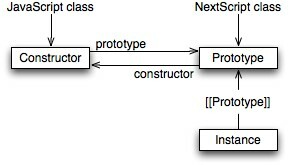 If NextScript cannot find a property in an object, it keeps looking in the prototype, then the prototype’s prototype etc. After the above declaration, obj has the prototype A. Classes: A class C is an object. It contains data that is shared by all instances (mainly methods). A special method called “constructor” sets up the instance-specific data (mainly data properties). Create a new object o whose prototype is C.
Getting the class: The class of an object is its prototype. Example: Are obj1 and obj2 (direct) instances of the same class? Subclassing: You extend an existing class C by creating a new object D whose prototype is C. If you want to inherit instance properties, you must call C.constructor() from D.constructor(). Normal method lookup: obj.m(). To find the method, we look for the first object in the prototype chain of obj that has a property m and invoke that property’s value. During this invocation, this is bound to obj, the object where the search began. Super-method lookup: super.l(). This invocation must be made from a method m. The search for l starts at the super-object of m (the prototype of the object that holds m). During the execution of l, this has the same value as it did in m.
Now Worker can be simplified as follows. Classes: A class is a constructor function C. C.prototype points to an object with the instance methods. C itself sets up the instance data properties. Create a new object o whose prototype is C.prototype. Call C with this pointing to the newly created instance. Instance check: o instanceof C checks whether C.prototype is in the prototype chain of o. Getting the class: via the constructor property. Example: Are obj1 and obj2 (direct) instances of the same class? Subclassing: You extend an existing class C by creating a new constructor function D. D.prototype has the prototype C.prototype. Example: We replace the default prototype and thus have to set Worker.prototype.constructor . Note that super-calls are orthogonal to new-style inheritance and would be just as useful in the above code. The same holds for the prototype operator <|. All in all, the prototype feels like the natural construct to represent a class. My initial idea  is similar to the hypothetical NextScript as described above. Afterwards, Allen Wirfs-Brock suggested how things could be adapted so that the existing “class protocol” wouldn’t have to be changed . This proposal might make it into ECMAScript.next. Make sure that C.constructor.prototype points to C. This step is needed for the new operator to work as described below. Interpret new C(...) as syntactic sugar for new C.constructor(...). Manually: The subclass extends Superclass.prototype. Constructor chaining and super-method calls should work as expected. Automatically: Extend the prototype operator <| so that, when it encounters a function f as its left-hand side, it makes f.prototype the prototype and not f.
Note that the internal structure is still the same as before. The only difference is that the variable that names the class refers to the prototype and not the constructor. The prototype operator <|, as introduced via NextScript. Super references, also as introduced above.